We are super proud to be working with FUEL | Girl Shaped Flames. 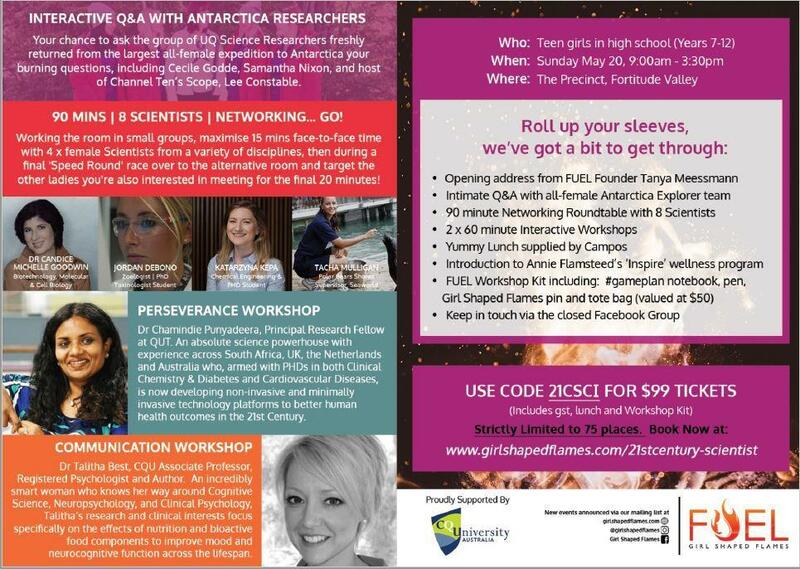 This time round we are sponsoring TWO girls to attend the upcoming 21st Century Scientist 1 day workshop with some amazing women in Science Candice Michelle Goodwin, Katarzyna Kępa, Talitha Best, Chamindie Punyadeera, Tacha Mulligan and Jordan Debono. To score one of our free tickets for a teenage girl you know hit up Tanya Meessmann but don’t worry you can get your teen girl into the workshop for $99 by using code 21CSCI at checkout if you miss out on our free spots.